You are here: HomenextPlacesnextSchoolsnextCarlton House Preparatory SchoolnextMy first school. I started at Carlton House Preparatory School, 50 Great College Street, Kemp Town, Brighton in September 1946. The school was run by an elderly lady called Miss Swan. (Nora Blake Swan 1879 – 1970) She was assisted by another couple of ladies whose names escape me now. 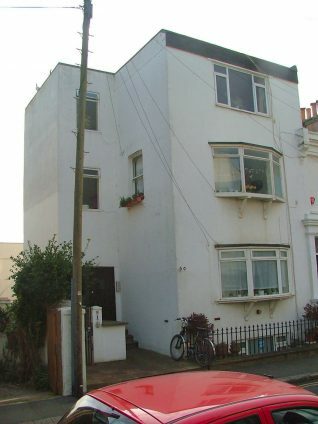 The school occupied the ground and first floors of an end of terrace Victorian house. The ground floor front room was the class for the new five-year-old first year pupils and the older children used the rooms upstairs. I think Miss Swan lived in the basement as we weren’t allowed down there. The music teacher was a Miss Loder, who was of a similar age to Miss Swan and lived in a flat on the sea front, possibly Chichester Terrace or Clarendon Terrace, where I would go once a week for my piano lessons after school. For gym we would go down to St George’s Church or church hall where there was a makeshift gymnasium. I remember climbing up a rope and being able to look down into the large glass bowl of the lights which hung on chains from the ceiling. Miss Swan was very keen on good manners and she would often tell us, “Manners maketh man”. I have always tried to adhere to this advice. My family lived in Sussex Square and many other children from the Square, Lewes Crescent, and the local area also attended Carlton House. Unfortunately, I am afraid their names are now lost in the mists of time. In the mornings, several of us would gather outside Mr Jones the newsagent’s kiosk opposite St Mark’s Church. and walk along Eastern Road, past the Clarence Garage, St Mary’s Hall girls’ school and the Royal Sussex County Hospital where we would turn downAbbey Road to the school in Great College Street. The journey was quite interesting as there was often a pavement artist outside St Mark’s Church who would collect a few pennies for his work, the roads were still being repaired by men with real steam rollers belching smoke and a night watchman would often be on guard with his coke brazier going. There was very little traffic about then as petrol rationing was still in force. The few cars that passed us were mostly pre-War and I could tell the different makes without looking as each had its own distinctive sound. I do not remember seeing any foreign cars in those days.